Digging Up Early Gameplay Features And Screens! 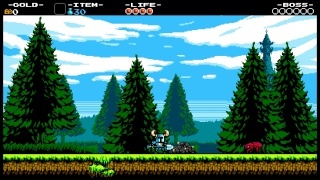 The highly anticipated eshop title Shovel Knight developed by Yacht Club Games releases next Thursday on both the Wii U and 3DS eshops! There's no denying the quality that this game possesses and for those of you who are looking forward to Shovel Knights release we've got a nice surprise for you as we will preview a part of the first level of the game in this article! 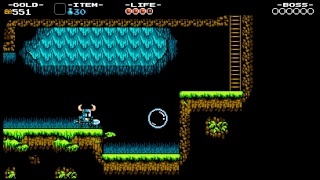 The first part of the tutorial level starts off easy to allow you to learn the basics such as digging up treasure and defeating sporadic enemies and as you can see in the screens above the visuals are breathtaking for an 8-bit title! Very quickly the starting level gets alot more intricate forcing you to use the downward strike and destroy earth blocks to obtain extra gold! The third part of the level forces you to use downward strikes on objects such as bubles which can allow you to reach ledges that are normally unreachable and if you look carefully you'll be able to spot weak spots in the ground that often yield gold and other secrets! You'll also face off against your first sub-boss of the game "shown below". You will then traverse through several rooms blocked by secret passages and alot of earth blocks before reaching the second checkpoint! A word to the wise don't attack the checkpoint or bad things will happen. 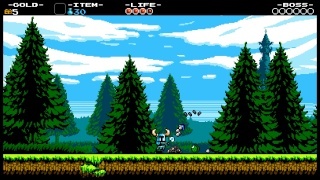 That's all for our preview of the first half of level one, be sure to checkout our review of Shovel Knight when it goes live on June 26th! Are you looking forward to this amazing title? Let us know in our comments below! 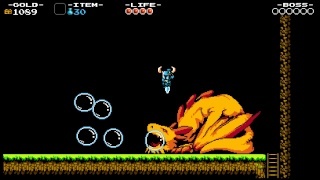 Shovel Knight looks like the epitome of a AAA NES game. 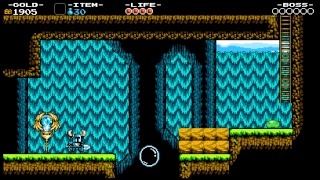 Shovel Knight is going to be one of the top selling eshop titles this year mark my words! I fixed a few cringeworthy typos. Which version is this Wii U? I'm just curious is all. I'm not a hugh retro fan at all. As a matter of fact I hate Mutant Mudds and can't even get into those style of games often anymore. This however looks special in many ways. Can't wait to give it a go! Also will this site be reviewing both copies of the game. I really need to make an informed decision on which copy I'll be getting. I'm still leaning towards the 3ds version just for the fact that graphics shouldn't play a big part! If the frame rate holds up then I'll probably get that version. @Tech101 wrote: Which version is this Wii U? I'm just curious is all. I'm not a hugh retro fan at all. As a matter of fact I hate Mutant Mudds and can't even get into those style of games often anymore. This however looks special in many ways. Can't wait to give it a go! This is from the Wii U version. Secondly yes we will be reviewing both versions of the game since each version has exclusive Gameplay features. I'll be reviewing the Wii U version while Gamergy will be reviewing the 3DS version. 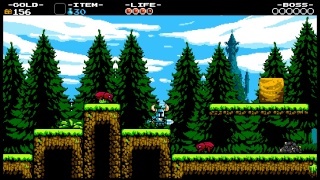 My review of Shovel Knight (Wii U eshop) won't go live until Thursday afternoon because the Miiverse features won't go live until Thursday morning and I want to cover those exclusive Wii U features in my review as well. Thanks for the response, looking forward to both reviews!